The old doorman always salutes. Just a little salute: given with a grin to anyone he greets. To us it’s a charming affectation, but for him it’s a duty. He’s living up to his uniform. The uniform is a hat and gloves, and a great coat: long, red, and trimmed with gold; closed with a row of shiny buttons. The coat seems huge. It expands the already burly Doorman (Emil Jannings) to an almost kingly girth. When wearing it, he pulls his spine straight, holds his head high, and strides through the streets to work. You would too. This is the outfit of a person with something important to do. 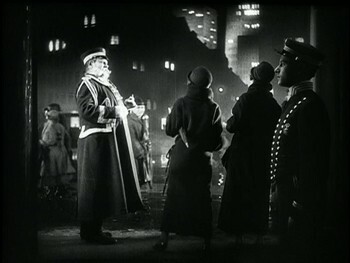 The Last Laugh, director F.W, Murnau’s greatest film, is about the forced removal of that coat. The Doorman, who has slung luggage from the tops of cars to the lobby of The Atlantic Hotel since before there were tops of cars, has grown old; he must give up his job to a younger, more vigorous man. So says the hotel manager. He will be given a job as a washroom porter instead. For some men, this would be better than being fired. For the Doorman, it’s worse than being dead. I once listened to a radio interview with an Olympic skier who had written a book about her experiences on the slopes. The most important part of her story was the end. One day, at the top of a mountain, at the peak of her fame, she tripped and fell. And broke her leg. Two days later, after a lifetime of training and absolute, singular focus on the perfection of her craft, she found herself at home, on her couch; her career over. She slipped into a deep depression following this. She’d left her whole identity on that mountainside. One false move, and it was all over for that skier. The line between success and failure; confidence and despair, proved imperceptibly thin but shockingly firm. Likewise for the Doorman: when he receives his notice of demotion, he goes catatonic. The manager’s lackey struggles to remove the coat; finally tearing it off; ripping a button free as though the old man were being court marshaled and stripped of his rank. Coatless, hatless, and now prideless, the Doorman instantly compresses into a wretched, dottering old thing with hair in his eyes. He’s led away in shock. I believe we all have a coat. For most of us, it isn’t a literal coat; it’s some object we own, or talent we possess, or job or pastime we do, which we feel defines us. Very likely it’s how other people define us too, but more importantly—first—it is where we perceive our sense of self to rest. We can’t imagine ourselves not owning, or doing, or being, that thing. The Doorman is surrounded by symbols of poverty; he lives in a cramped apartment with his niece, in a part of town reminiscent of the Worker’s City in Metropolis; but when he dons his coat and hat and walks past his neighbours on his way to work, he seems better than all that. Not better than them—he’s not that kind of man. Just someone who has made good, and is comfortable being admired. Everyone still gets a salute. When he loses the coat, they mock him; proving his worst fears to be true. 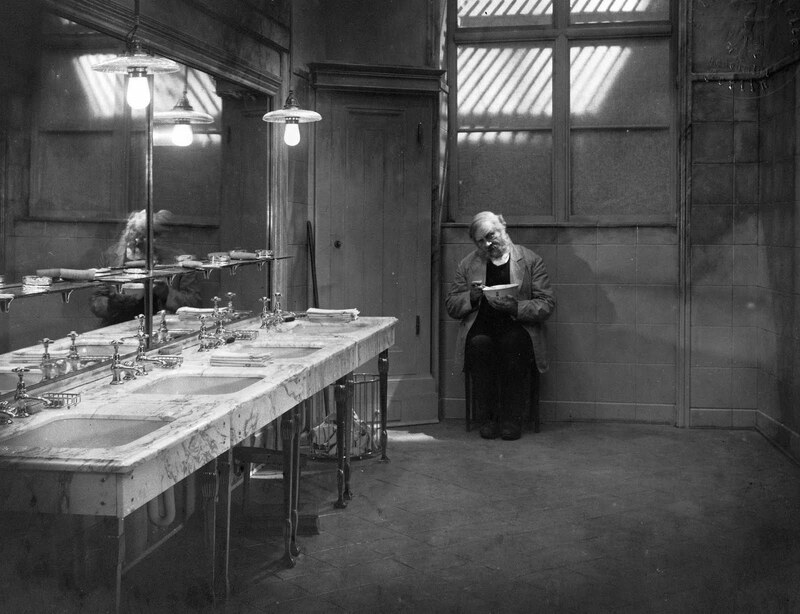 Like most of Murnau’s films, The Last Laugh feels avant-garde, without feeling modern. 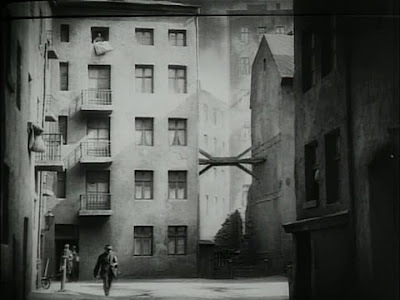 The director’s camera shakes, drops, floats and flies in keeping with the Doorman’s state of mind, and even his state of intoxication (to manage this, Murnau had it mounted on a bicycle and even slid down a zip-line). Multiple exposures let us share in the Doorman’s delirium. Reality is subjective: the part of the city occupied by the hotel is little more than dark outlines in the shape of buildings, pock-marked with squares of light—even when we’re close to it, it seems as though we’re looking at it from far away. It is the essence of a vigorous cityscape, not an example of one. And we never see anything of the Doorman’s commute. There’s only hotel and tenement; job and home; rich and poor. More fine lines. If you haven’t seen The Last Laugh, I bet you know it best for two things: having practically no intertitles, and having a controversial, highly debatable ending. In fact, the film has only one true intertitle, and it comes right before that ending; acknowledging, cheerfully, that the ending is a cop-out. This means that not one word of character dialogue is transcribed in the entire film—the only feature-length silent I’ve ever seen where this occurs. 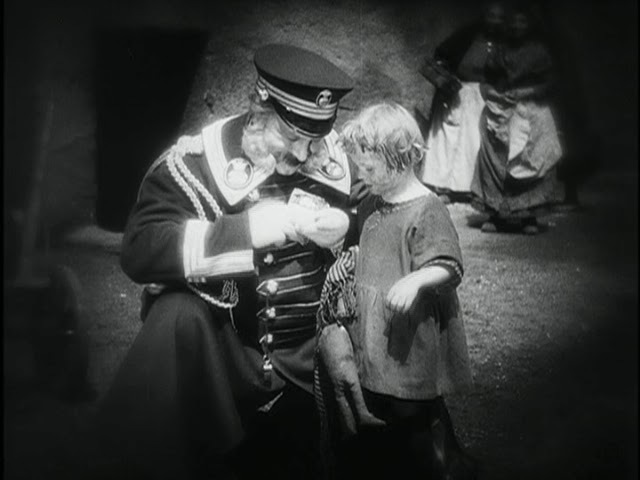 It also means that Murnau considered no piece of dialogue crucial to the story, having the utmost faith in its universality. I think his faith was well-founded. It’s difficult to talk about the ending without revealing it. I can say that it comes about when the Doorman’s despair has finally overtaken him; when he sits slouching and withered in his white coat, in the rich man’s washroom, alone and seemingly close to death. This is a heartbreaking moment for the audience. And then the film fades to black. 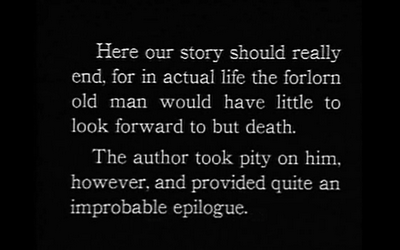 And then, Murnau presents us with a possible resolution. The film acknowledges, and so must we, that this resolution is unlikely; it is unsupported by events prior, and works only because it pleases us. Much as we take visceral pleasure in watching a villain beaten, we enjoy happy endings like this one. 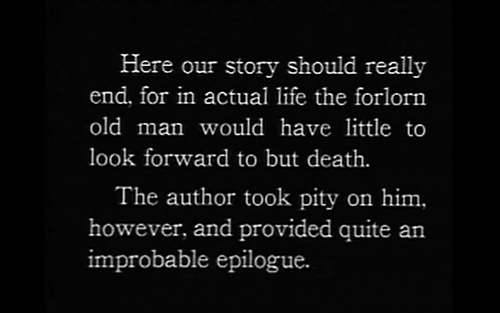 Some interpret this ending as Murnau’s way of jabbing at Hollywood studios and their need for crowd-pleasing conclusions. I don’t. I think it all fits. The Doorman’s new change in circumstances is just as sudden as the one before it. His state of despair proves just as tenuous as the state of joy he’d known before losing his coat. And when he returns to the hotel as a great man, it is through his possessions—and the clothes he wears—that he’s perceived as such. New coat, new man. We say it’s not that simple, but on the bad days, we wonder. I’m a lucky man. I got to see The Last Laugh on the big screen, courtesy Revue Cinema’s Silent Sundays series, programmed by Toronto’s Eric Veillette. Live piano accompaniment was provided by Laura Silberberg. The Last Laugh is also available on DVD, through Kino International.